We just love apples! Our favorite fall fruit is divine all by itself but also adds flavor to everyday menus. Fall baking wouldn’t be complete without pies and cakes full of apples, but savory dishes are also lovely complemented with apples. Position oven racks on the middle and lower rungs; preheat to 200°. Line 2 baking sheets with parchment paper. Combine the sugar, cinnamon and nutmeg in a small bowl. Use a mandoline or very sharp chefs knife to cut the apples vertically into 1/8-inch-thick rounds. You do not need to core or peel the apples. 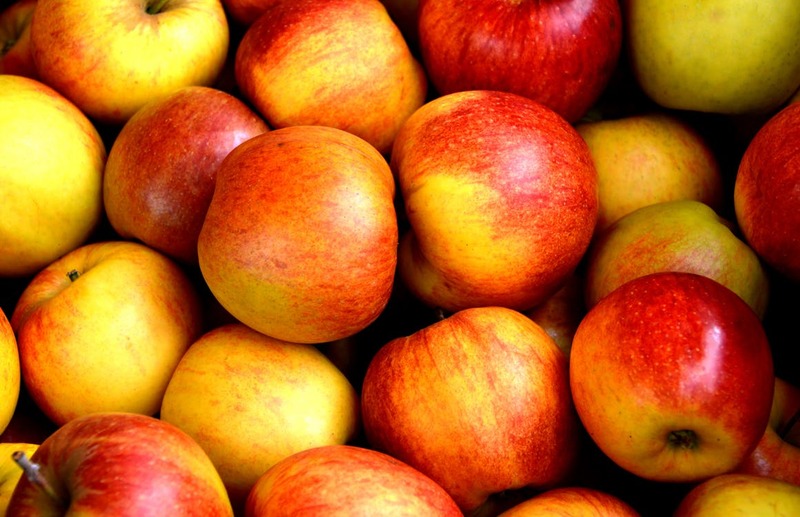 The seeds will fall out or can easily be removed from the apple slices after cutting. Arrange the apple slices on the baking sheets in a single layer; sprinkle with the cinnamon mixture. Bake for 1 1/2 hours, then rotate the sheets top to bottom and front to back. Bake for 1 hour, then turn off the oven. If the apple slices are not dry and crisp, leave in the (closed) oven overnight. Use a spatula to loosen the crisps from the parchment paper; store in an airtight container. Cook bacon in a 12-inch heavy skillet over moderate heat, stirring, until crisp, about 5 minutes. Transfer to paper towels to drain, then add bread cubes to fat in skillet and cook over moderate heat, stirring, until crisp, about 5 minutes. Transfer to paper towels and season with salt and pepper. Note: to make this recipe vegetarian, omit the bacon and fry bread cubes in 2 tablespoons olive oil until crisp and browned. Or use Fakin’ Bacon, a delicious tempeh alternative to bacon. Preheat oven to 350°. In a 12-inch cast iron skillet, melt 4 tablespoons butter over medium heat. Add the apples, and sauté in batches until lightly browned but still firm. Set the apples aside on a plate. In a large bowl, stir together the half and half, salt, pepper, cinnamon, and nutmeg. Toss the potatoes in the cream to coat. Generously butter an 8 x 8 baking pan. Line the bottom of the dish with a layer of overlapping potatoes, followed by overlapping apples. Repeat, finishing with a layer of potatoes. Pour in remaining spice-cream mixture. Cover with aluminum foil, and bake for about 1 1⁄2 hours, or until the potatoes are cooked. Heat the broiler. Sprinkle panko over the gratin, dot with 1⁄2-inch cubes of the remaining butter, and broil until the bread crumbs are golden brown. Puree soup using a handheld blender until smooth. Thin with more broth if desired. Season with salt, pepper and lemon juice. Ladle into bowls and sprinkle with parsley. Preheat oven to 375 degrees F. Add apples, lemon juice, sugar, flour, spices, and salt to a medium bowl and stir together until well combined. Lay 1 egg roll wrapper onto a clean surface and brush edge with egg wash. Spread 3 tablespoons apple filling across one side of the prepared egg roll wrapper. Carefully roll filling tightly in the wrapper folding in the sides as you go, and press gently to seal. Place onto a baking sheet lined with parchment and coat with cooking spray. Repeat with remaining filling and wrappers. Bake egg rolls for 20 to 25 minutes or until golden brown. During the last 5 minutes of baking, remove from oven and brush with a little melted butter and sprinkle cinnamon and sugar on top. Put back in oven for remaining 5 minutes. Remove peel from lemon in wide strips with vegetable peeler, then squeeze 2 tablespoons juice. In 4-quart saucepan, combine lemon peel and juice, apples, cider, figs, cherries, sugar, cinnamon, and salt; cover and bring to a boil. Reduce heat to medium-low; simmer, covered, 30 minutes, stirring occasionally. Serve warm or chilled. Goes good with ice cream, yogurt, or pound cake.